Within every mythology is a tale of the fall from grace, where the hero, in spite of a history of achieving the impossible, succumbs to some fatal flaw and becomes a villain. Perhaps the most iconic and widely known example in the modern age is the Judeo-Christian tale of Lucifer’s corruption and fall, becoming Satan. But what flaw is big enough to cause a hero to falter in such a tremendous way? In the aforementioned example, they are the traits considered sins in the biblical sense: pride, envy, and even wrath. But in general mythological terms, good characters are made evil when they succumb to their own weaknesses. And those weaknesses need not be large so much as deep. 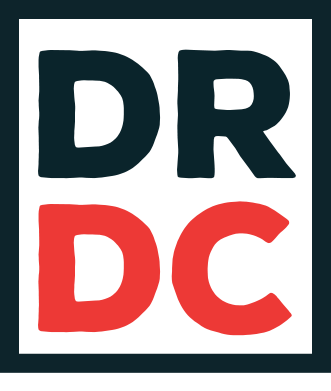 In the mythology of DC Comics, this deep-rooted flaw is the undoing of one of the greatest and most powerful superheroes of all time. 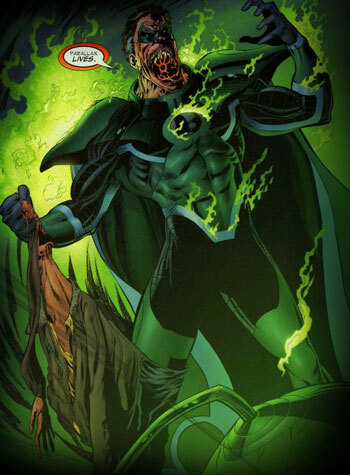 I am referring, of course, to the fall of the Green Lantern, Hal Jordan, to the parasitic creature known as Parallax. Parallax is one of several Emotional Entities; beings representative of the different lights of the Emotional Spectrum. 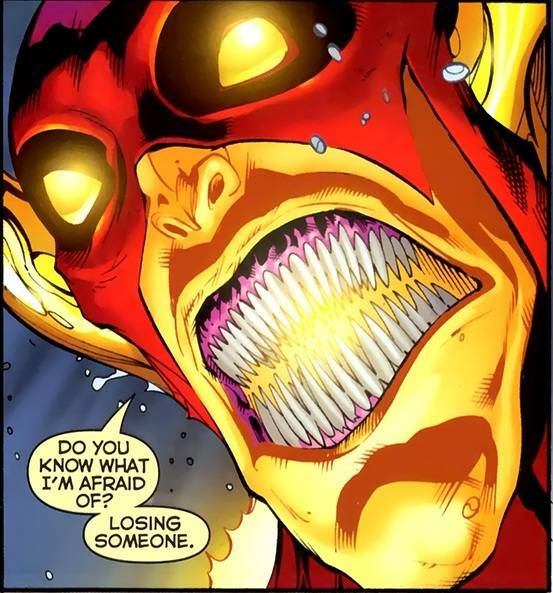 Composed entirely of Yellow Light energy, Parallax is the living embodiment of Fear and came into being at the first moment that a sentient being felt afraid. It both feeds on and inspires the fear in the hearts of others, travelling the universe inciting paranoia and terror for centuries before the Guardians of the Universe imprisoned it within the Central Power Battery on Oa – the opposing Green Light of Will containing the creature. As with other Emotional Entities, Parallax can exist on its own, but it prefers to take a host body, through which it can amplify and focus its power. Any moment of fear or anxiety can be enough to allow Parallax to take hold of a host. This is precisely what happened to Hal Jordan in the early 90’s during the events of the “Emerald Twilight” arc. Following the events of “Reign of the Supermen”, during which a coordinated attack by Mongul and the Cyborg Superman completely annihilated his hometown of Coast City, Hal Jordan tries to cope with the tragic loss of his home. He creates a construct of his own father and seeks his approval for what he has become, but instead finds that his own fear of failure is reinforced. Convinced he could have done more, that the destruction of Coast City was a personal failure, Hal is overcome by grief and descends into madness, resolving to take the power of the Central Power Battery for himself. He marches on Oa, defeating wave after wave of Green Lanterns before eventually killing his friend and trainer Kilowog, several of the Guardians, and his arch-nemesis Sinestro, who had been released from imprisonment within the Battery by the Guardians as a desperate last resort. Hal destroys the Central Power Battery, taking its power and becoming a supervillain. No longer a Green Lantern, he takes up a new mantle: Parallax. As it turns out, Sinestro’s imprisonment in the Central Power Battery woke Parallax and together they plotted the downfall of the Green Lantern Corps, with Hal Jordan serving as the eventual host of the creature. Of course, when “Emerald Twilight” was published, the name Parallax referred only to Hal’s new villainous persona. It wasn’t until 2004’s Green Lantern: Rebirth that Parallax’s true nature was retconned into place. In the real world, this served to redeem Hal Jordan for his horrific crimes during his tenure as a supervillain. But within the mythology, the reveal of Parallax as one of the Emotional Entities provided new insight into how a hero can fall from grace. Parallax did not strike quickly. It did not burst forth from its prison and take its host by force. It was patient, quietly influencing and manipulating events, Jordan, and the Corps itself. 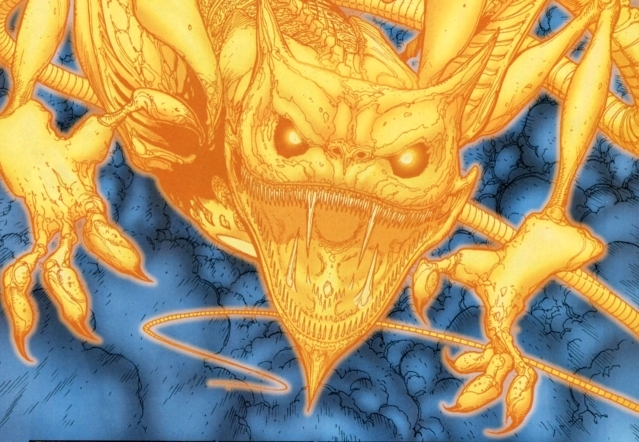 After all, the “yellow impurity” that long plagued the Corps – in which a Green Lantern’s constructs had no power over the colour yellow – was a direct effect of Parallax’s presence within the Green Battery. The metaphor is thinly veiled but incredibly potent. In the heart of even the most determined – those with limitless willpower – are the seeds of doubt. Doubt in a plan’s success. Doubt in one’s ability to accomplish the impossible. The fear of failure. Parallax spent years quietly nurturing those seeds within Hal Jordan, subtly eating away at his will and replacing it with fear and anxiety, a symptom of which was the premature greying of his hair. The destruction of Coast City was an affirmation to Hal of his greatest fear – that he did not deserve the power he was given, that he wasn’t a worthy successor to the Green Lantern Corps. Hal succumbed to fear and unknowingly provided the opening Parallax needed to take hold within his mind, guiding him to destroy the Central Power Battery in order to set its prisoner free. Hal is not the only hero to succumb to Parallax. It has possessed Green Lantern Kyle Rayner, the Flash (Barry Allen), and Sinestro. It even managed to possess Ganthet, one of the Guardians of the Universe. This demonstrates the universal nature of fear. There is no such thing as a person completely without fear. What makes a hero strong is not being without fear, it is the acknowledgement of those anxieties and remaining steadfast in spite of them. Fear and doubt are the engine of the self-fulfilling prophecy. When a car slides off the road, the driver that stares in fear at the telephone poll will steer the car directly into it. Symbolically, this holds true of Parallax. Though it can survive on its own, Parallax thrives when it has a host. It is a parasite – feeding on the existing fear within one’s heart and reinforcing it in order to control the trajectory of its host. While “Emerald Twlight” demonstrates that a hero can succumb to that fear, Green Lantern: Rebirth is the arc that reveals how it happens. The mythological significance of Parallax is that it teaches us the nature of fear. Fear is not a sudden thing. It is a crack in the armour that starts small and grows with every wear. It creeps and crawls, burrowing deeper and deeper into one’s heart. It gnaws and erodes at a person’s roots until eventually there isn’t enough foundation left to hold up the heroic façade and that hero falls. Parallax represents not only the fall from grace of Hal Jordan, but the potential to fall of every hero in the DC Universe. After all, a hero is only as strong as their will to fight for what they believe is right. And fear is the enemy of will. ** This article was originally published on Modern Mythologies. I’ve got (surprise) a theory on this. And your use of the word “possessed” when describing the nature of Parallaxes relationship with Kyle, Barry, Sinestro, and Ganthet (though the later two took him on more willingly) is apt to bring up this discussion. Hal’s relationship with Parallax is UNIQUE. The way Johns writes it in Rebirth, Parallax was weak in the battery. He reached out through the network of the battery (the rings) and found Hal. This resulted in his hair prematurely greying. This ALSO means Parallax was an INFLUENCE, not a POSSESSOR. As a result, though the influence of Parallax may have been at it’s height during Emerald Twilight, it was STILL just that, INFLUENCE. 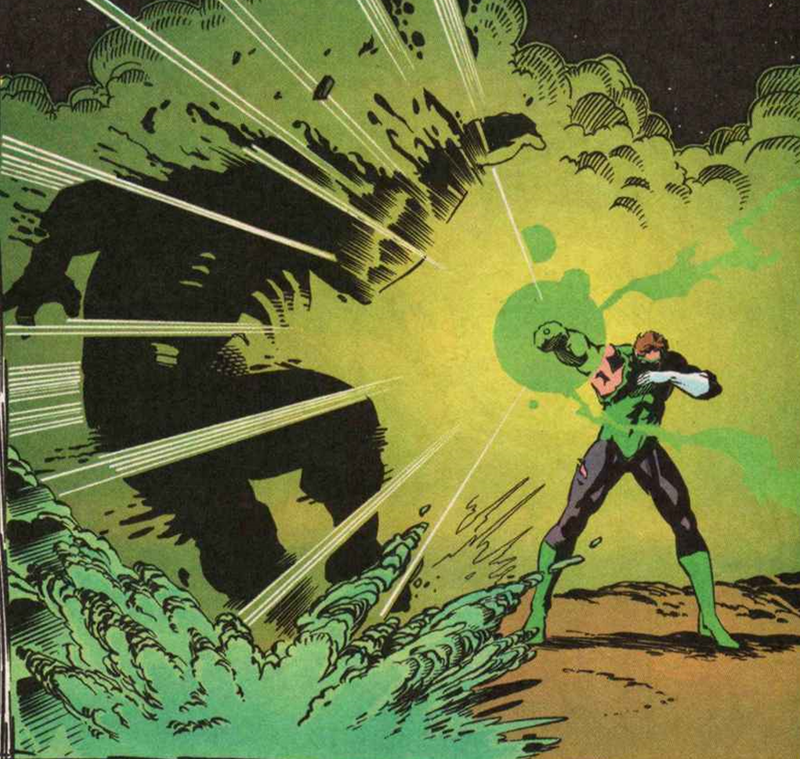 Parallax did NOT possess the body of Hal Jordan and CONTROL his actions until Hal entered the battery. Everything up until that point? That’s Hals doing. His doing at the influence of a yellow devil on his shoulder, but Hal was in the pilots seat regardless. And when Hal made “questionable” decisions as the Spectre towards the end of his tenure in the role? That was the devil on the left shoulder (Parallax) and the angel on the right shoulder (Spectre) playing tug-of-war with the man (Hal) in between. Who’s responsible for what after Final Night/Day of Judgement? That’s anyones guess. But for me? There’s NO DOUBT. Before Hal entered that battery during Emerald Twilight, he is responsible for his actions. I certainly don’t disagree with the logic. In terms of the redemption of Hal Jordan though, I think Johns would want us to assume that even though there is a difference between influence and possession, that Parallax’s influence had been gestating long enough to really compromise Hal’s judgment. Otherwise, it would be VERY difficult to be on Hal’s side. But I think you’re right, and I like to think that Bats actually put this little piece of logic together himself and that’s why he takes so much longer to forgive/accept Hal after he returns. This is a solid theory!